Before I became a Christian in 1985, I was an atheist. As a scientist by training, my inquiring mind simply did not allow me to accept by faith the creationist theory of Genesis and other incredible stories of the Bible. By the grace of God, He led me to stumble upon the writing of Anselm, an 11th. century monk. His axiom: “For I do not seek to understand so that I may believe; but I believe so that I may understand. For I believe this also, that unless I believe, I shall not understand.” completely altered my view of God, the Bible and the purposes of my live. Indeed, faith precedes reason, and that reason can expand upon faith. For we are his workmanship, created in Christ Jesus unto good works, which God hath before ordained that we should walk in them. Ephesians 2:10 (KJV). Being Christians, do not make us any less human than others. We still have afflictions, addictions and agonies to overcome. The difference is the way we now choose to fight them. But we are all as an unclean [thing], and all our righteousnesses [are] as filthy rags;... Isaiah 64:6 (KJV). I chose to live a life by faith in Christ. It is by faith that I enter into the Christian life, and it is by faith that I shall live it out. 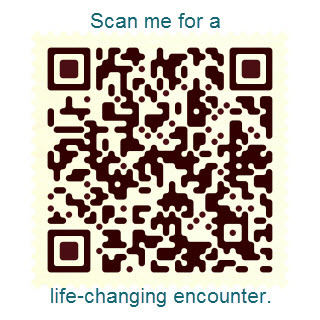 If I could share one other thing with you about me it would be this - CHANGE! If you are unhappy with what you are doing, then do something about it - CHANGE. You may ask what to change? Ourselves! Although it is not found in the Holy Bible, there is truth in the saying: "God helps those who help themselves". Blaming gets us nowhere and many times, external factors are not responsible for our success. "You cannot pursue after success, but you can become the person that success is attracted to" - Jim Rohn. Aside from that I'm a firm believer on the importance of one's CHANGE process. As such, we place lots of emphasis on spiritual and personal development and leadership program. When we change, results change! The best thing about having my own businesses is working with a team of like-minded international business entrepreneurs. We encourage and motivate one another to move forward in the challenging and exciting world out there. We guide people to their success, achieving what they have been looking for. There is nothing more rewarding than building people. The satisfaction is like seeing a seed growing into a tree. For me, it all started when I realized that I've traded off many important aspects like freedom, security and time with loved ones in exchange for earning money. For more than 20 years in the IT industry, I seldom had time for my own life! When I was in between jobs or when my traditional businesses were not doing well, guess what, my income stopped! I constantly asked myself: "Is this worth it?". 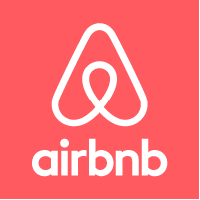 When I was introduced to these businesses, I immediately saw the options that would supplement my family's income, yet still allow me to pursue my dreams. I started my first passive income business part-time in early 2003 and after just 2 months in the business, I decided that this is the lifestyle that I want to lead. I have found that this is a perfect combination as I now feel the total balance in my life. 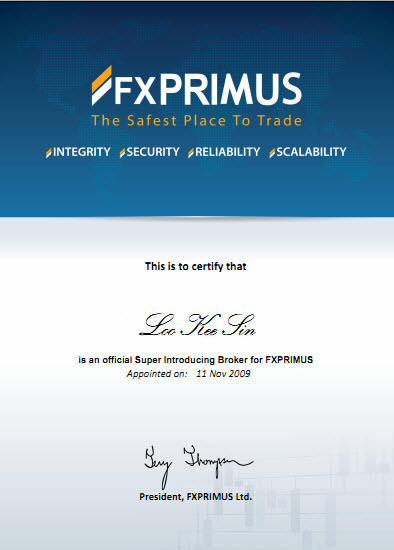 I trade Forex 外汇 since 2010 with my own EAs (trading robots) and earn residual income as a Super IB (Introducing Broker) with Fxprimus, a non-dealing desk and ECN MT4 broker. I also help my traders to become more productive by automating their profitable trading rules for FREE. These activities allow me to enjoy a better lifestyle that I have never had before as an IT professional for some 30 years of my working life. 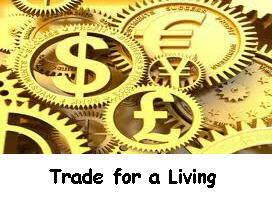 Trading is, without doubt, the very best lifestyle that anyone can imagine. While successful traders won't blame others for the money we lose occasionally, neither do we have to be apologetic to anyone for our winnings. In other words, when we are free from contractual obligation, there is no necessity for us to be politically correct and that can make a great difference in the enjoyment of life as a trader. In the Parable of the Talents (Matthew 25:14-30; Luke 19:12-28), we are to make good use of our God given abilities/money to achieve a positive return on our investment of time and resources. Failing to do so will incur God's wrath. 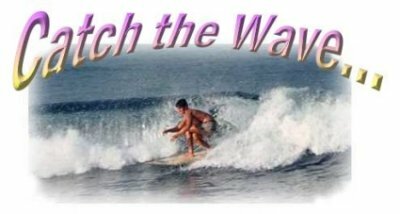 While some may interpret Psalm 128:2 You will eat the fruit of your labor; blessings and prosperity will be yours as trading our time for money like those toiling a 9-5 work day, I choose to make good use of my analytical and programming skills to automate my trading as well as for my traders to generate consistent incomes from the Forex market. Automation increases our productivity and frees up time for us to do things that matter more to us than just hard work! My automated Forex trading provides me with the means and freedom to spend more quality time with my family and friends. The growing pipelines of my IB business on auto-pilot is also generating an increasing stream of income for me and my family. I welcome you to join me in this wonderful world of Forex trading. 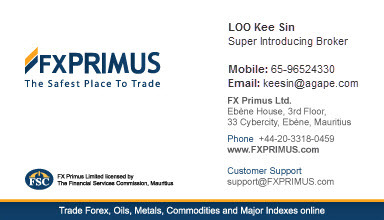 Please ensure that the Referral ID is 374 when you do sign up at http://fxprimus.com/index.php?r=374 so that I can be of service to you. 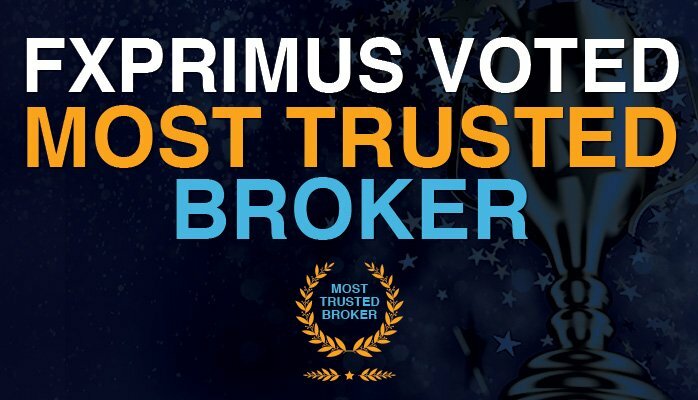 Then talk to me on how we can work together to improve your trading profit via automation and build your streams of recurring income as an Affiliate/IB with Fxprimus. 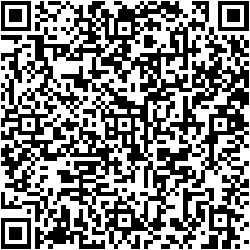 Do contact me if you are looking for a better and smarter way to work for a living. I have since transformed myself from being a local bucket carrier to a global pipeline builder. The opportunities for growth, taking on challenges, meeting new international friends, earning multiple streams of recurring income, the freedom to choose who to meet, where, when and what to do. Having more quality time for my family and friends. has enriched my life tremendously! God blesses us not so we can become selfish consumers but so we can become selfless channels of His blessings to others. My current mission is to help others to live their life prayerfully, positively and powerfully with their home based businesses. I invite you to make your CHANGE today to create a brighter future for yourself and your loved ones by gaining the freedom of doing what you like and the joy of liking what you do! “The human being needs a challenge, and my advice to every person in Singapore and elsewhere: Keep yourself interested, have a challenge". Have a purpose driven life and finish well, my friends. - The Late Mr. Lee Kuan Yew, (1923-2015) Founding Prime Minister of Singapore. We thank God for granting Mr Lee the wisdom, integrity and gumption to steer Singapore from a precarious past to a prosperous present and a promising future. 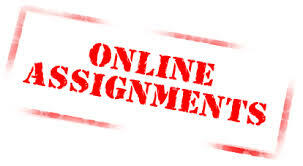 Ordinary people are already reaping financial rewards with our online businesses. So can YOU. Success in this industry requires more than just great and in-demand products and services. It also requires a combination of passion, practice and perseverance. WE can help. Jesus did not come into the world to make bad men good. He came into the world to make dead men live! 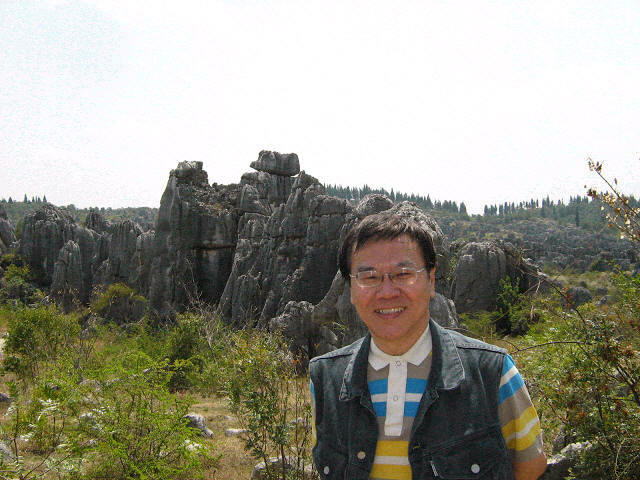 On a holiday with my cell group at 石林 Stone Forest, Kunming China, March 2008. 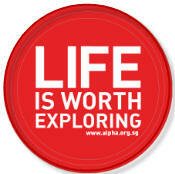 Birthday celebration with fellow 'Alphaholics' in Hakka Methodist Church, May 2012. 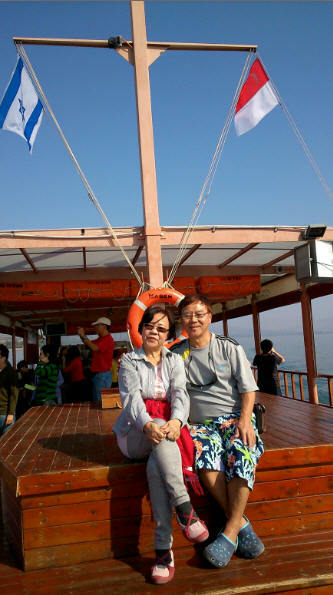 The Bible came alive and in color - walking, I mean cruising on the Sea of Galilee, November 2013. 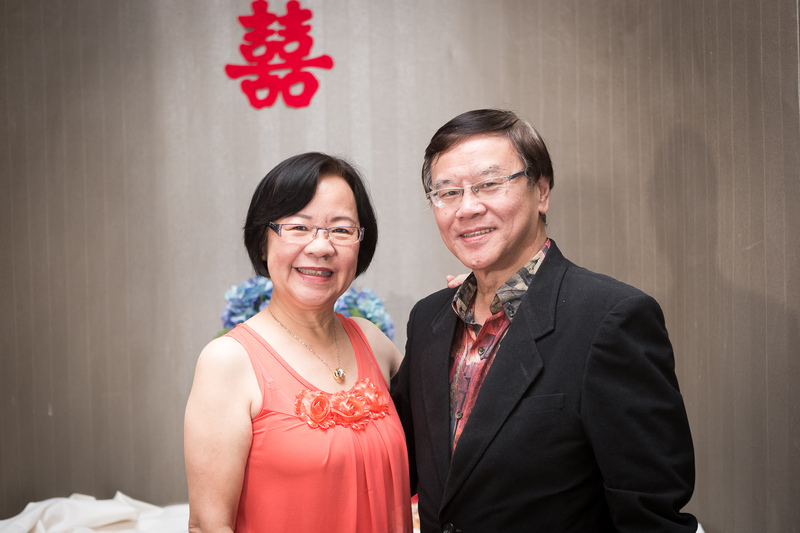 A photo-take at the end of a Marriage Course from 28-30 Nov 2014 at Changi Village Hotel. Kee Sin holds a M.Sc. in Computing. Member of the Hakka Methodist Church 卫理公会客音天恩堂. Senior Member of the Singapore Computer Society 新加坡电脑学会. Charter President of the SRC Toastmasters Club 新加坡康乐俱乐部演讲会. 1 Peter 2:16 - "Live as free men, but do not use your freedom as a cover-up for evil; live as servants of God ."